"Avishkaar s E-Series Full Kit is India's first and most advanced programming kit for children. Designed specifically for slightly older kids (12+ and up), they can create different kinds of robots like black line follower, obstacle avoider, humanoids, and more. 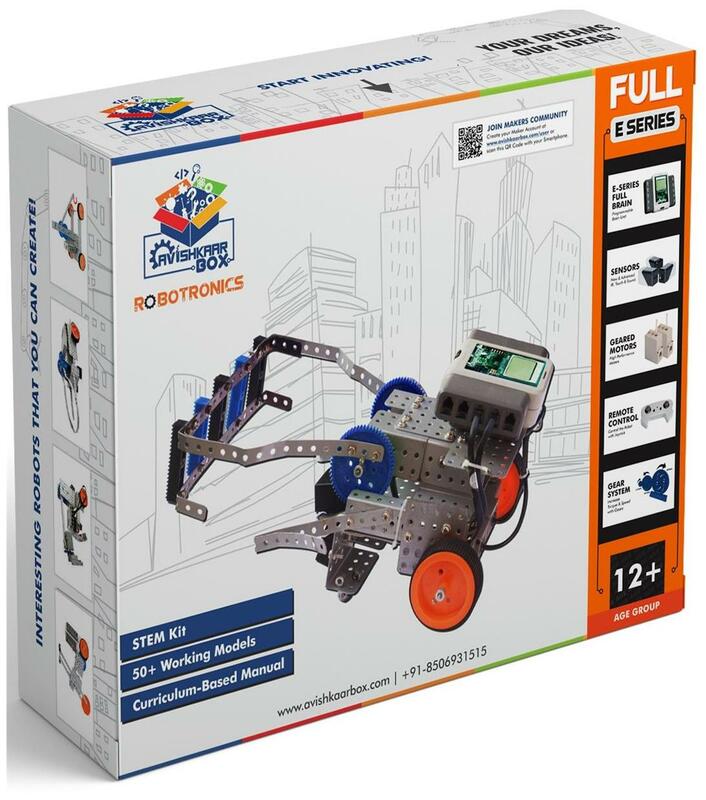 FULL Kit introduces block-based programming through which older aged kids can get a hands-on experience of how to program robots. FULL kit s Brain enables the use of four motors and five sensors at the same time. They can program both the motors and sensors at the same time offering a much greater degree of functionality. In FULL kit, you ll receive three different kinds of sensors - IR, touch and sound. FULL Brain can be controlled three ways - by a wired remote, wireless application as well as by writing and burning programs. The software used to program the brain is Avishkaar Maker Studio (AMS), our in-house developed software. AMS utilizes graphical based coding making it pretty easy to write, code and burn programs. After getting the hang of AMS s block interface, children can easily graduate to other programming languages such as C and Python."